My grocer, just down the road, has become inundated with squashes of all shapes and sizes, just waiting to be devoured. Orange, yellow and green, their vivid colours signify the season in which they are most fruitful (if you’ll pardon the pun). 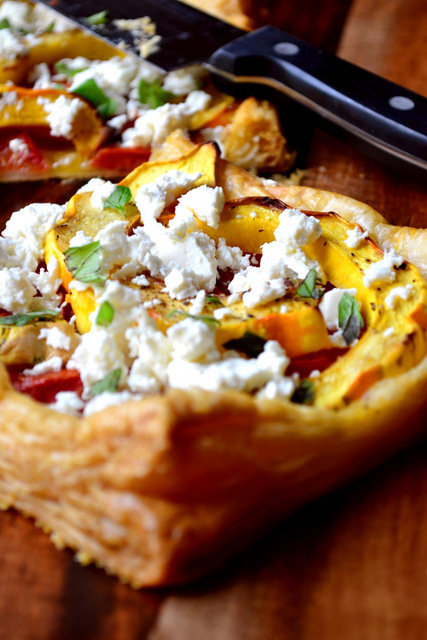 The large chunks of sliced fruit atop this Squash and Feta Puff Tart could scarcely be more reminiscent of autumn; their vibrancy almost atoning for shortened evenings and colder weather. Almost. An uncomplicated tart, topped with only a few ingredients and made using inexpensive shop-bought puff pastry, this dish is easy on the wallet and simple in its making. 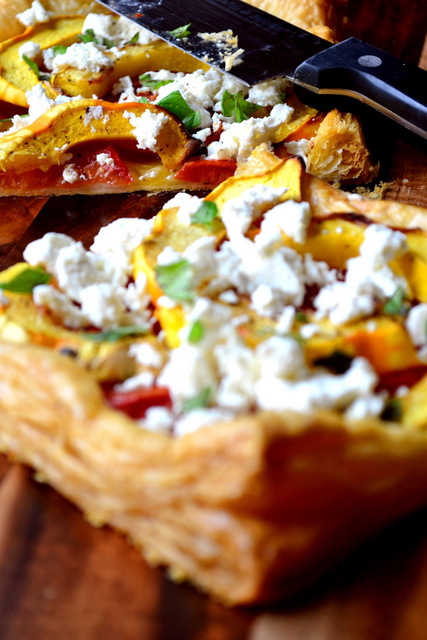 If you have even half an hour to spare then a squash and feta puff tart is well within your grasp. This may be simple fare, but the flavours represented here are nevertheless wonderful. The sweet celebration squash, for instance, juxtaposes the sharp feta cheese nicely, making for a rather compelling mouthful. The tomatoes too, which become almost oven-dried, add to this overall effect, with the crisp, layered puff pastry providing a textural contrast to the otherwise soft ingredients. The mint? 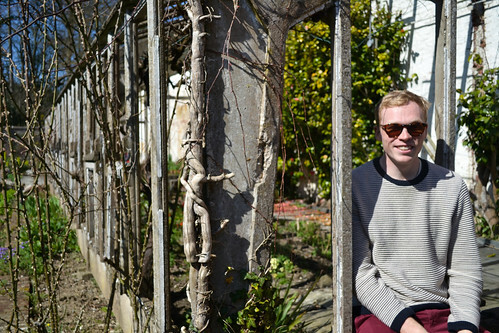 Well, that’s there for a little added freshness and a spot of green to make the photos look nice. If you’re looking for a quick autumn lunch or supper when you’re in something of a rush, then this is the tart for you. 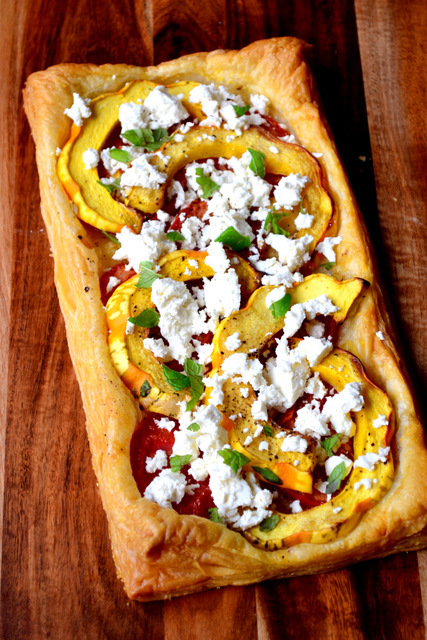 Ready in not much over half an hour, my pastry-bottomed squash and feta puff tart is the real deal and the perfect remedy for the onset of cold weather. Preheat your oven to 190C/170C fan. Sprinkle a baking sheet with a little fine polenta or cornmeal. Prepare your squash by slicing it in half, removing the innards of one half and slicing it to as to produce beautiful crescents of squash, roughly 1cm thick. Save the other half for another tart. Place the prepared pastry on the baking sheet and layer with the sliced tomato, leaving a border of roughly an inch all the way around. 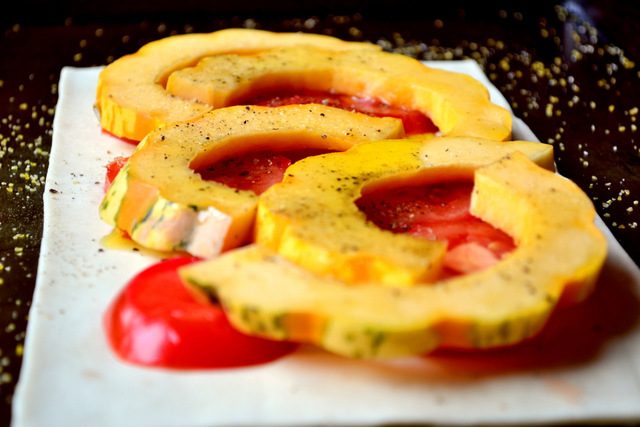 Arrange the squash on top of the tomato, sprinkle with olive oil, salt and pepper. Place in the oven to bake for 30 minutes, or until puffed and golden brown. Once cooked remove from the oven and transfer to a chopping board. Crumble the feta cheese over the tart and finish with a few sprigs of torn fresh mint. Serve immediately or once cool. The tart should happily last 2-3 days when refrigerated. Cost: I feel it must be said; pre-packaged puff pastry is both simple and – probably – better than what you’re likely to make at home. Not to mention time saved! In fact, so cheap is this tart in its entirety that you should be able to turn it out of the oven for as little as £1.30. An autumnal must-bake! This looks lovely. Feta cheese and winter squash are two of my favorite things — and I still have late tomatoes because of the drought (all sun, no rain). That’s very impressive – we’re cold and wet here. Looks delicious! Squash is super tasty; I’ve even taken to eating plain roasted squash as a snack! That’s a great idea! Frugal too.